Joseph Williams was born in 1886 in Higher Kinnerton, Flintshire, the son of William and Emma Williams, nee Lewis. Joseph was one of 11 children. His siblings were Martha, born 1867, Thomas, born 1868, Robert, born 1870, Ellen, born 1872, Mary, born 1874, Sarah, born 1877, Annie, born 1881, Joseph, born 1886, and Frederick, born 1889. There were a further 2 children, but I have not been able to trace them. Joseph first appears on the 1891 census living in The Grange, Higher Kinnerton, Flintshire, with his father William 47, a Railway Labourer (plate), born in Kinnerton and his mother Emma 44, born in Sealand. There were 5 children living with them, Robert 21, Bricklayers labourer, Ellen 19, no occupation, Sarah 14, Annie 10, Scholar and Joseph 5, Scholar. All the Children were born in Higher Kinnerton. On the 1901 census the family were still living in The Grange, Higher Kinnerton, Flintshire. Living there were William 57, Emma 54, Fred 12 and Albert 7, Grandson. In 1901 Joseph was not living with his family but at Dodleston Hall working as a House man (servant) for John Pickering, Farmer. Joseph married Louisa Jane Daulby in 1908 at St Marys Church, Dodleston, Cheshire. On the 1911 census Joseph was living at Grange Cottage, Higher Kinnerton with his wife, Louisa 26, Herbert 2, son and Nora 1, daughter. His occupation was Labourer on farm and he had been married for 3 years. It also states that there were 2 children born and 2 living in 1911. On the 1911 census, Joseph’s Mother Emma was living at Grange Cottage and was a widow. She was living with Frederick 23, a Waggoner on farm and Stella Williams 10, granddaughter. Its states she had been married 40 years and had 11 children with 8 still living in 1911. 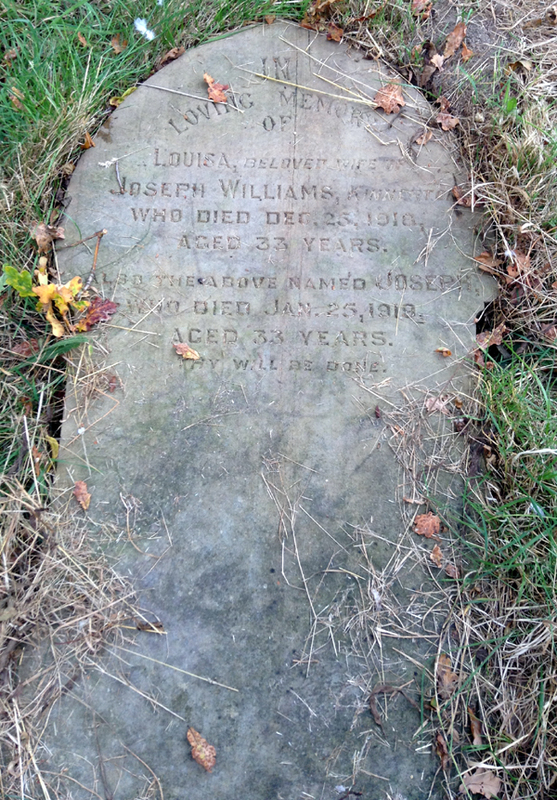 Joseph’s wife, Louisa died on 25th December 1918, 4 weeks to the day before Joseph. She is also buried in the Churchyard at All Saints Church, Higher Kinnerton. It’s not known how many children they had, but at least two of them were left orphans. I have not been able to find a record for Joseph on http://home.ancestry.co.uk/ in ‘UK, Soldier Died in the Great War, 1914-1919’. The ’British Army WW1 Medal Rolls Index card 1914-1920’ on www.ancestry.co.uk confirms his medals, rank, regiment and regimental number. I have not been able to find an index card for Joseph in the Flintshire Roll of Honour at the County Records Office Hawarden.